I’ve been loaned an interesting and inexpensive pair of small passive hi-fi speakers recently and I’ve spent some time using them in the context of both casual listening and for more music production oriented monitoring. They’re worth I think a few paragraphs of description and analysis. 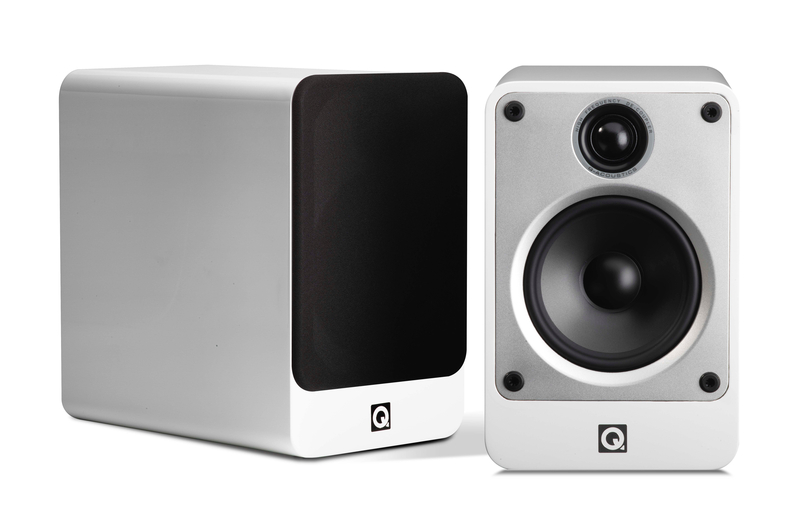 The speaker in question is the Q-Acoustics Concept 20. Q-Acoustics arrived on the hi-fi scene a decade or so ago and although the company has little of the speaker engineering heritage of, say, a KEF or a Bowers & Wilkins, it immediately drew upon the expertise of a bunch of people who do. In particular, Q-Acoustics employs electro-acoustics design consultant Karl-Heinz Fink. Karl-Heinz and his colleagues have forged a particularly successful speaker electro-acoustics consultancy (https://www.fink-audio.net) over the past 30 years and have been responsible for rather more than perhaps a fair share of notable hi-fi speaker designs. In more recent times Fink consulting has become a manufacturer in its own right with a couple of innovative high-end speaker marketed under the Finkteam brand (https://www.finkteam.com). Back on the Q-Acoustic Concept 20, at first sight, the speaker is nothing remarkable with just its extended depth dimension indicating perhaps something out of the ordinary. Otherwise, it’s a simple, compact, rear port-loaded, two-way, stand-mount design with a thermo-plastic diaphragm 125mm bass/mid driver and a 25mm soft dome tweeter. The Concept 20 however incorporates two hidden features that mark it out as unusual. Firstly, it has a mechanically decoupled tweeter, and secondly, it incorporates an unorthodox, low-resonance cabinet construction. I first became aware of decoupled tweeters on Naim Audio speaker designs of the 1980s, and on niche UK based manufacturer Roksan’s first speaker (the Darius of 1986). Since then, Mission and Bowers & Wilkins at least have occasionally employed the idea. There’s probably numerous examples of unintentionally decoupled tweeters too: speakers on which the tweeter mounting screws have loosened over the years, or perhaps were never tight in the first place. At the heart of the decoupling idea is that when a tweeter is rigidly attached to the cabinet it will be “shaken” by the the bass and mid drivers exciting the cabinet panels. Doing the maths illustrates the potential significance: if music has a dynamic range of say, 60dB, that represents ratio of 1000:1. So if a tweeter dome moves, say 0.5mm at 0dB, it’s displacement at -60dB is in the order of 0.0005mm, or five ten-thousandths of a millimetre. That’s a very, very small distance and can be comparable to the movement of panel vibrations. Two things will result if the tweeter is shaken about by movement of the cabinet panels. Firstly, the shaking effectively raises the high-frequency noise-floor of the speaker, which may mask low-level detail in the audio signal. And secondly, if the shaking is particularly strong at specific frequencies as a result of a discrete panel resonances, raised levels of high-frequency intermodulation distortion* will result. A cut-away of the Concept 20shows the “Gelcore” in green. The second hidden feature of the Concept 20 is its cabinet construction technique. Q-Acoustic call the technique “Gelcore” and it comprises a cabinet constructed from two layers of MDF that trap a layer of non-setting mastic. The correct technical term for this style of sandwich panel is, “constrained layer damping” and it can be highly successful at suppressing flat panel resonance. Wrap the side panel of a Concept 20 with a knuckle and a notably dead thunk results. And the reason I wrote at the top of the post that the extended cabinet depth of the Concept 20 points to something unusual is that the Gelcore technique probably steals internal cabinet volume, so the depth is extended to compensate. Going to such lengths to stop cabinet panels playing along with the music and adding their own character is decidedly unusual on a relatively inexpensive speaker and it speaks highly of the design intent behind the Concept 20. The same could be said of the decoupled tweeter. The result of the Concepts 20 tweeter decoupling and Gelcore cabinet, along with the Fink touch for selecting drivers and voicing systems, is a remarkably capable and engaging little speaker that’s as at home just playing records as it is in the music production nearfield monitor role. * Intermodulation distortion results when two audio signals modulate each other. Imagine a tweeter playing a 2kHz tone. If a cabinet resonance simultaneously accelerates the tweeter body backwards and forwards at, say, 200Hz, the tweeter output will feature “side bands” at 2kHz + 200Hz (2.2kHz) and 2kHz – 200Hz (1.8kHz). Intermodulation is a particularly insidious distortion because it bears no harmonic relation to the input signal. As a result it can be audible at relatively low levels. I like reading your reviews on sos and on this blog. They offer an insight on speaker designs that is very hard to find. In this article I have seen you are touching briefly on intermodulation. Would you consider writing an article on that, covering how intermodulation might effect speakers like our beloved KEF LS50? It is a very unsual but interesting topic..